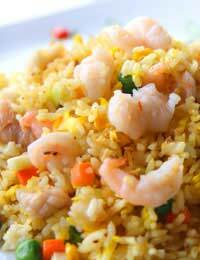 Oriental rice salad with mixed peppers and prawns is a delicious crunchy salad that can be prepared quick and easily. How about oriental matchstick and prawn salad matchsticks with rice paper wraps. 1/2 a yellow pepper that has had its seeds removed and has also been sliced thinly. To make your Oriental rice salad with mixed peppers and prawns first combine all the dressing ingredients in a salad bowl and then add to it all the other ingredients and ensure that they are coated in the dressing. A variation on the Oriental rice salad with mixed peppers and prawns recipe is the Oriental matchstick and prawn salad with rice paper wraps. To make your Oriental matchstick and prawn salad with rice paper wraps first chop the prawns, making sure you hand squeeze any excess liquid out with your hands, then chop approximately 1/3 of your already prepared chilli and ginger before placing the chilli,ginger and prawns in a bowl along with the soy sauce, coriander and dash of lime juice. Ensure that all the ingredients are mixed well in the bowl. Next take some warm water and fill a wide, but shallow, bowl before placing the individual rice paper wraps in the water for approximately 20 seconds each. This should ensure that the rice paper wraps loose most of their stiffness. After a their short soaking remove the rice paper wraps from the warm water and place on a flat service, after first gently shaking them in order to remove any excess water. After this place the vegetables in just half of the rice paper wrap before poring a tablespoon of the prawn mixture over the vegetables and folding the rice paper from the bottom and sides.